In summer 2018, we left Switzerland to spend three months in Nepal. The first two months, we planned to stay in a project organized by ICYE and one month we planned to travel. We didn’t really know what to expect in Nepal. We knew that we were going to work in an orphanage and that it was our task to help take care of the children there, but it was all very vague so we could not really imagine how it will be. We went to Nepal in the rainy season, so we also didn’t know how much we will be able to travel. This was what our first couple of days were like in Nepal: we had no idea what our work at the project is going to be, whether we will able to travel and overall, what Nepal will be like. We got picked up at the airport and transferred to the volunteer house. We took rest the day. The next morning, Pratima, our contact from ICYE Nepal, gave us a short orientation class. We were briefed about the program, our duties and responsibilities, dress-code and cultures and customs of Nepali people. Based on this. Introduction, we decided to stay in the hostel in Kathmandu for one week. We had some very interesting language classes with Pratima. Together with Pratima, we were able to visit some interesting places in Kathmandu. With her, we also learned how to travel by bus in Nepal. We traveled to different famous temples in Kathmandu in overcrowded public buses. These were lessons which made our life in Nepal much easier. After one week at the hostel, we were brought to our project in a village outside of Kathmandu. Thanks to these lessons on how to use the Nepalese public transport system, we were still able to visit Kathmandu for sightseeing or for shopping. We had a very warm welcome in the orphanage. All the children told us their names. However, it took us almost two weeks to remember all of them. We were also shown our room, which was about five minutes away from the orphanage. We were able to stay with the parents of the orphanage’s president Tej. The room offered more a lot more comfort than we expected. After unpacking our stuff, we went back to the orphanage and were invited to join the children in a football game. In the evening the Tej showed us our schedule. From Switzerland, we were used to such organization, however, we did not expect it for such a small institution such as Horac. Thus, we were very grateful for it. Nevertheless, despite this clear schedule, after a couple of days, we noticed that this schedule was to be interpreted very loosely. Every day was different and a lot.of.unexpected things happened. Sometimes we were told, about what will be going on, and.sometimes this was not the case. It took us some time to accept that we could not understand everything. After a while, however, we started to take every day as it came. And accepted that it.was always full of surprises. Those made our time in the orphanage much easier and we could enjoy spending time with the children without any pressure. Still we struggled regularly with the difference of the cultures and learned a lot about acceptance of other cultures and ways of life. We spent a lot of time with the children, especially with the younger ones. We played football when the playground was dry, were taught to play a typical Nepalese board game and built a lot of houses and trucks out of Lego. During study time, we helped the children do their homework and study for their exams. These were interesting hours, especially with the older children because very often we ended up discussing different subjects: favorite animals, favorite food, the differences between Switzerland and Nepal or movies. With the younger children, it was a bit more difficult because their English was not as good yet. Nevertheless, it was impressive how much their English improved over the two months that we stayed there. 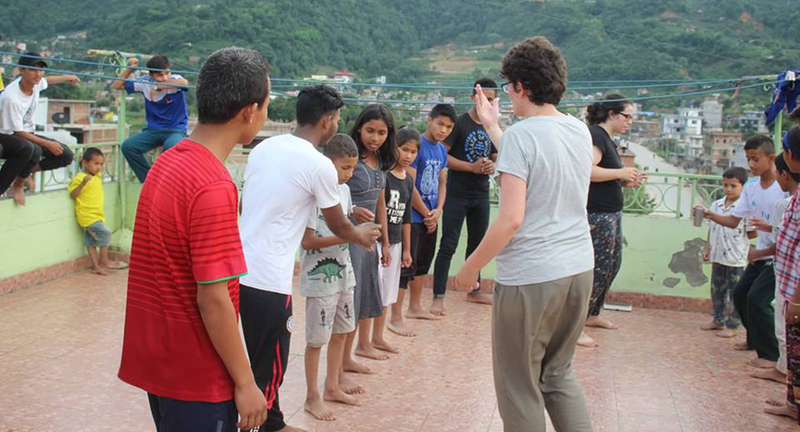 Once a week, we organized some special programs for the children, a game or quiz or we cooked some Momos and once we even cooked a special Swiss food. These were always special moments, for both the children and for us. We had a lot of fun. The children had one week of holidays and we could do some short trips in the area. The children were happy to show us their country and their favorite places. The time went by very fast and suddenly, it was already time to say goodbye. We were asked to write in the diaries of most of the children and got a lot of letters from them. For our last dinner with them, we bought meat and the cook made the most delicious meal out of it. The next morning we accompanied them to school one last time. With all these impressions and memories, we then started our travels through the beautiful country that is Nepal.